Art Gallery of Ballarat, Ronald Wrigley Estate, 1979. 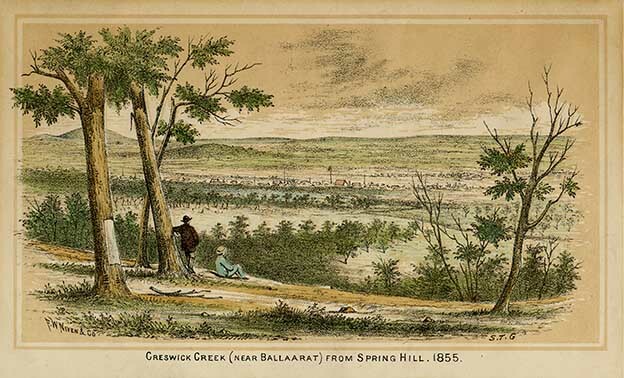 Creswick Creek Near Ballarat From Spring Hill, 1855"
Members of the Ballarat Reform League visited Creswick and spoke at open air meetings. Harry Williams stated in his Memoir that Peter Lalor was working on Clark's Flat, Creswick, and abandoned his claim to go to Ballarat shortly before trouble started brewing. In late October 1854, the road to the Government Camp at Creswick Creek was crowded with diggers so incensed by the oppressive license system and general injustice that they threatened to burn the Camp, and demanded the removal of all officials. The protest was quelled, but the anger returned on 25 November when delegates from Ballarat’s vigorous Reform League rode in to seek support for their democratic protest and their condemnation of officials. Four days later, about 2,000 men, from the population of 25,000, met at Long Point to promise support. Licenses were burnt and, led by a German band, a contingent of about 150 set off for Ballarat travelling via Clarke’s Flat and Black Lead, encouraging fellow miners to join them. Legend has it that some were caught in a thunderstorm at Mopoke and returned home. Yet it is recorded that about 500 Creswick men arrived at the stockade in Ballarat on 1 December 1854. The Creswick men joined the Ballarat men in their defensive stockade, standing up for their rights and liberties. The Stockaders were no match for the Government forces, who stormed the stockade and even massacred bystanders early on the morning of 03 December 1854. GEELONG. - (FROM OUR OWN CORRESPONDENT. )- Monday. 23rd October. 1854. CRESWICK'S CREEK,-We have been informed that information we received in town on Saturday last that the diggers had threatened to destroy the Government Camp at this place. 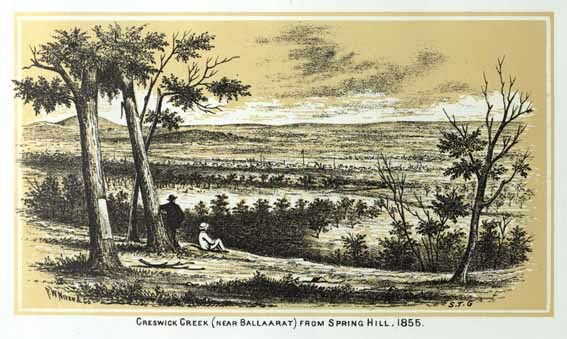 Almost all the troopers in Melbourne and Geelong, besides some four or five companies of the 18th regiment, have been despatched to the diggings, so that they may be in readiness to act either at Creswick's Creek or Ballaarat if required. We understand the grievance at Creswick's Creek is the license-tax. The diggings were stirring! The Moreton Bay Courier was reporting agitation in November 1854: At the Ballarat diggings there had been a riot amongst the diggers. A large number had assembled at the Commissioner's Camp, at Creswick's Creek, and insisted that that officer, together with all the Police, should at once leave the place, and never return. There was a rumour that they had set fire to the camp. They had undoubtedly threatened to do so. The Eureka Hotel at Ballarat, had been burnt down by the diggers. ↑ Graham, John A. Early Creswick: The First Century, Arbuckle, Waddell Pty Ltd, Melbourne, 1942, p58. ↑ Geelong Advertiser, 24 October 1854. ↑ Moreton Bay Courier, 04 November 1854. ↑ Geelong Advertiser,4 December 1854. This page was last edited on 6 August 2017, at 12:20.